While working at Bosch Power Tool as an industrial designer, our team designed the smallest 12V cordless drill on the market. I was the lead designer throughout the lifespan of the project, from the first sketches to the production line. The product was released in the US in 2012, you can buy it here and read people's generous reviews on Amazon. When using a power tool, our hands go through intense shock and vibrations. Being able to provide a comfortable grip can ease the vibration, and give a steady hold. 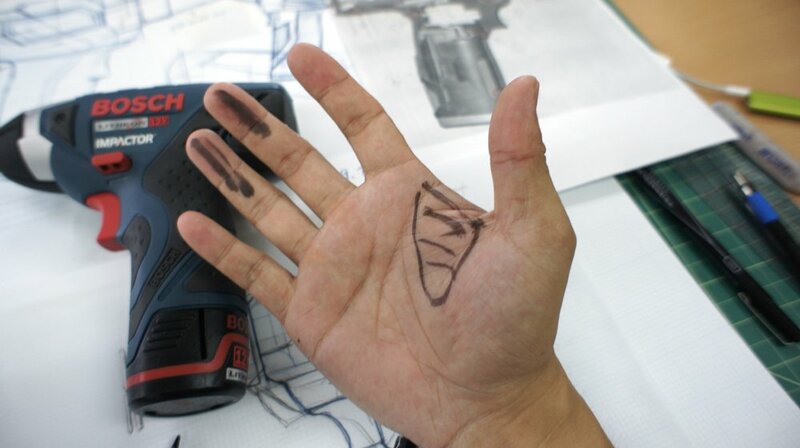 I used and studied various tools and learned about the touch points between user’s hand and the tool. Before I start to design, I've mapped out all the critical components of the tool: motor, gearbox, switch and battery pack. Working with engineers, we tried to find a balanced weight distribution of the tool, so when holding the tool, the user won't feel it's tilting upwards or downwards. With a mapped skeleton component in hand, I start to work on the industrial design of the tool. Some of the design principles here are: demonstrate this is a powerful device, a modern and balanced look and belong to the Skil (a brand owned by Bosch)'s design language. Working with the engineers, we’ve built out the model in CAD and prototyped it in various materials. We tweak the design in each variation, and resolved issues like motor overheating and switch failure. Shipping a product is never easy. When we started a pilot production run, we once again ran into issues with the switch. The engineers, PMs and the workers on the assembly line all came together to resolve the issue. I was amazed by the creativity from all the people I worked with. By the end of the project, the company made a internal video to show case our work and our process. It was really funny and I am so proud by this cheesy video. Team: Liu Jiguo, Jiang jie, Mallika Patel, Ma Hongyan, Yang Hengxing.